I am sorry that the focus is on you and not on the many adults who contributed to this situation. I am sorry that the color of your skin caused some people to make you feel like you did or did not belong. I am sorry that many of you will now be apprehensive about going to pools and social gatherings with your friends. I am sorry that this will be the way you remember how your summer of 2015 kicked off. I am sorry that the value of your home too often determines the value people place on you. I am sorry that we did not prepare you to recognize and handle the amplifying power of social media. I am sorry that you felt scared. 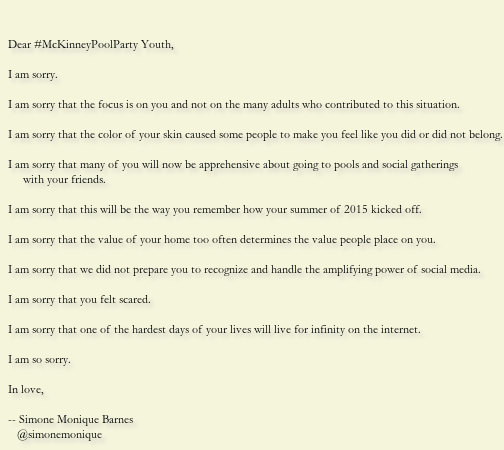 I am sorry that one of the hardest days of your lives will live for infinity on the internet.